Version is either “V1.0” or “beta” ; the resource type might be “user” or “group”, or “notebook” and so on and a useful one is “me”; but you might call user/ID to get a different user. to get the data you make an HTTP GET request which returns JSON; to add something it is usually a POST request with the body containing JSON which describes what you want to add, updates happen with a PATCH request (more JSON), and DELETE requests do what you’d expect. Not everything supports all four – there are a few things which allow creation but modification or deletion are on someone’s to do list. Once you can make your first call to the API the same techniques come up again and again , and future posts will talk how to get PowerShell formatting working nicely, and how to create JSON for POST requests without massive amounts of “text wrangling” But as you can see from the map there are many rabbit holes to go down, I started with a desire to post a message to a channel in Teams. Then I saw there was support for OneDrive and OneNote , and work I had done on them in the past called out for re-visit. Once I started working with OneDrive I wanted tab completion to expand files and folders, so I had to write an argument completer … and every time I looked at the documentation I saw “There is this bit you haven’t done” so I added more (I don’t have anywhere to experiment with Intune so that is conspicuous by its absence, but I notice other people have worked on that), and that’s how we end up with big software projects … and patterns I used will come up in those future posts. I recently I wanted a script to be able to post results to Microsoft teams, which led me to the Microsoft Graph API which is the way to interact with all kinds of Microsoft Cloud services, and the scope grew to take in OneNote, OneDrive, SharePoint, Mail, Contacts, Calendars and Planner as well. I have now put V1.0 onto the PowerShell Gallery , and this is the first post on stuff that has come out of it. Registering applications and services which permission will be delegated to, and giving them a unique ID; this allows users to say “This may do that”, “Cancel access for that” – rogue apps can be de-registered. Authenticating the user (once) and obtaining and storing their consent for delegation of some scope. Sending tokens to delegates – WordPress sends me to Twitter with its ID; I have a conversation with Twitter, which ends with “give this to WordPress”. Tokens help when a service uses a REST API, with self-contained calls. WordPress tells Twitter “Tweet this” with an access token which says who approved it to post. The access token is time limited and a refresh token can extend access without involving the user (if the user agrees that the delegate to should be allowed to work like that). Azure AD adds extra possibilities and combined with “Microsoft Accounts”, Microsoft Graph logons have a lot permutations. The application directs users to a web login dialog and they log on with a “Microsoft Account” from any domain which is not managed by Office 365 (like Gmail or Outlook.com). The URI for the login page includes the app’s ID and the the scopes it needs; and if the app does not have consent for those scopes and that user, a consent dialog is displayed for the user to agree or not. If the logon is completed, a code is sent back. The application presents the code to a server and identifies itself and gets the token(s). Sending codes means users don’t hold their own tokens or pass them over insecure links. For options 1 & 2 where the same application can be used by users with either Microsoft or Azure-AD accounts, applications are registered at https://apps.dev.microsoft.com/ (see left). The application ID here can be used in a PowerShell script. 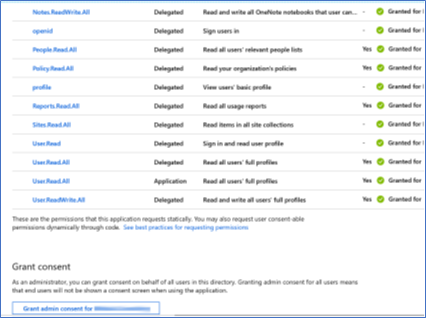 The Admin Consent / User consent tabs in the middle allow us to see where individual users have given access to scopes from a consent dialog, or see and change the administrative consent for all users in that Azure AD tenant. The App calls up the same web logon dialog as the first two options except the logon web page is tied to specific Azure AD tenant and doesn’t allow Microsoft accounts to log on. The only thing which has changed between options 2 and 3 is the application ID in the URI. This kind of logon is associated with an app which was not registered at https://apps.dev.microsoft.com/ but from the App Registrations section of the Azure Active Directory Admin Center. An app registered there is only known to one AAD tenant so when the general-purpose logon page is told it is using that app it adapts its behaviour. Registered apps have their own Permissions page, similar to the one for enterprise apps; you can see the scopes which need admin consent (“Yes” appears towards the right). When Azure AD stores the permitted Scopes for an App, there is no need to interact with the user (unless we are using multi-factor authentication) and the user’s credentials can go in a silent HTTPS request. This calls a different logon URI with the tenant identity embedded in it – the app ID is specific to the tenant and if you have the app ID then you have the tenant ID or domain name to use in the login URI. 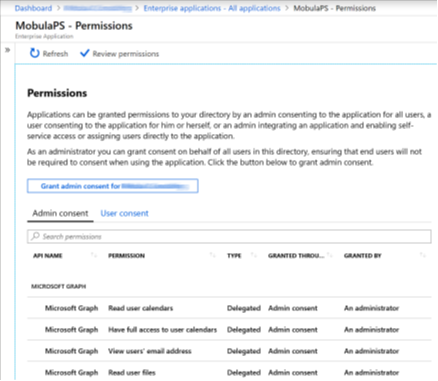 All the cases up to now have been delegating permissions on behalf of a user, but permissions can be granted to an Azure AD application itself (in the screen shot on the right user.read.all is granted as a delegated permission and as an Application Permission). The app authenticates itself with a secret which is created for it in the Registered Apps part of the Azure AD admin Center. The combination of App ID and Secret is effectively a login credential and needs to be treated like one. Picking how an app logs on requires some thought. Is all its functionality Azure AD/Office 365 only (like Teams) ? After this runs $oauthApp has an access_token property which can be used in all the calls to the service. $cred = Get-Credential -Message "Please enter your Office 365 Credentials"
$oauthUser = Invoke-RestMethod -Method Post -Uri $uri -ContentType "application/x-www-form-urlencoded"
I like this method, because it’s simple, has no dependencies on other code, and runs in both Windows-PowerShell and PowerShell-core (even on Linux). But it won’t work with consumer accounts. A while back I wrote something which built on this example from the hey scripting guy blog which displays a web logon dialog from PowerShell; the original connected to a login URI which was only good for Windows Live logins – different examples you find will use different end points – this page gave me replacement ones which seem to work for everything . This script uses Windows Forms which means it doesn’t have the same ability to run everywhere; it defines a ‘call back’ URI, a ‘token’ URI and an ‘authorization URI’. The browser opens at the authorization URI, after logging on the server sends their browser to callback URI with code=xxxxx appended to the end the ‘NativeClient’ page used here does nothing and displays nothing, but the script can see the browser has navigated to somewhere which ends with code= or error=, it can pick out the code and and it to the token URI. I’ve built the Authorization URI in a way which is a bit laborious but easier to read; you can see it contains list of scopes separated by spaces, which have to be escaped to “%20” in a URI, as well as the client ID – which can be for either a generic app (registered at apps.dev.microsoft.com) or an azure AD app. The middle part of the script creates a the windows form with a web control which points at the authorization URI, and has a two line script block which runs for the “on_DocumentCompleted” event, it knows the login process is complete when the browser’s URI contains either with a code or an error when it sees that, it makes the browser’s final URI available and closes the form. When control comes back from the form the If … ElseIf checks to see if the result was an error or a code. A code will be posted to the token granting URI to get the Access token (and refresh token if it is allowed). A different post to the token URI exchanges a refresh token for a new access token and a fresh refresh token. To test if the token is working and that a minimum set of scopes have been authorized we can run the same script as when the token was fetched silently. 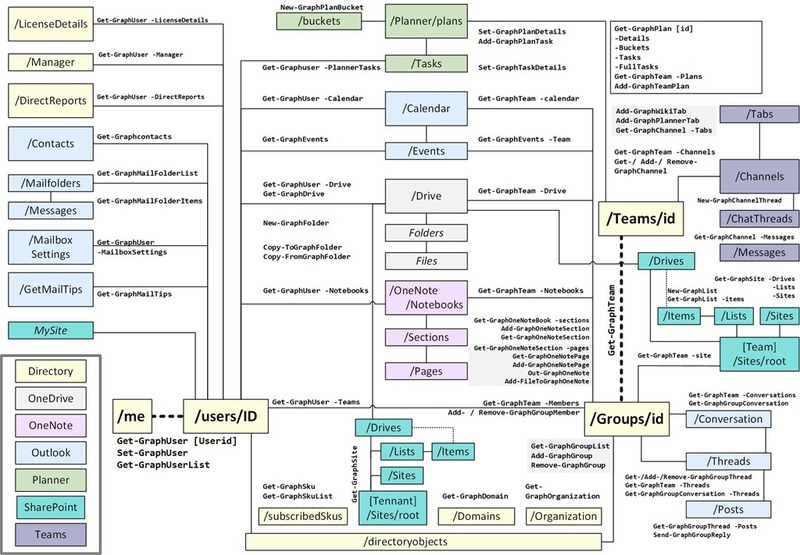 In the next part I’ll start looking at calling the rest APIs, and what is available in Graph.